Arf Activation Assays | Cell Biolabs, Inc.
Our Arf Activation Assays use visible agarose beads to selectively precipitate the active form of Arf1 or Arf 6. 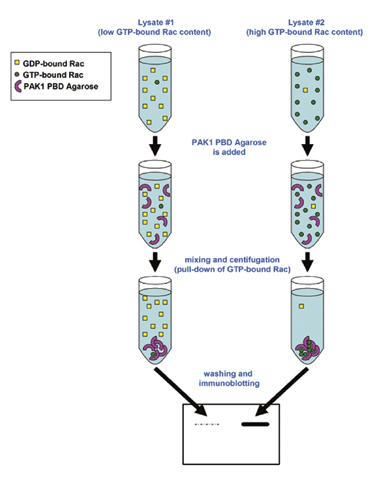 The precipitated small GTPase is then detected by Western blot using an Arf1- or Arf6-specific antibody included in the kit. Casey, C.A. et al. (2016). Study of ethanol-induced Golgi disorganization reveals the potential mechanism of alcohol-impaired N-glycosylation. Alcoholism: Clin. and Exp. Res. doi:10.1111/acer-13247 (#STA-407-1). Fischer. A. et al (2016). AKT-dependent phosphorylation of the SAM domain induces oligomerization and activation of the scaffold protein CNK1. Biochimica et Biophysica Acta - Mol. Cell Res. 1864:89-100 (#STA-407-1). Loskutov, Y. V. et al. (2014). NEDD9/Arf6-dependent endocytic trafficking of matrix metalloproteinase 14: a novel mechanism for blocking mesenchymal cell invasion and metastasis of breast cancer. Oncogene. doi: 10.1038/onc.2014.297 (#STA-407-1). Matsumoto, Y. et al. (2016). Inhibition of epitehlial-mesenchymal transition by cetuximab via the EGFR-GEP100-Arf6-AMAP1 pathway in head and neck cancer. Head Neck doi:10.1002/hed.24626 (#STA-407-6). Dutta, D. & Donaldson, J. G. (2015). Sorting of clathrin‐independent cargo proteins depends on Rab35 delivered by clathrin‐mediated endocytosis. Traffic. doi: 10.1111/tra.12302 (#STA-407-6). Cheung, H. N. et al. (2014). FE65 interacts with ADP-ribosylation factor 6 to promote neurite outgrowth. FASEB J. 28:337-349 (#STA-407-6). Grossmann, A. Et al. (2013). The Small GTPase ARF6 Stimulates β-Catenin Transcriptional Activity During WNT5A-Mediated Melanoma Invasion and Metastasis. Sci. Signal. 6:ra14 (#STA-407-6).